My friend's mum died this week. Since he told me, I've had the strongest memory of walking into her house a few years back and being hit with the smell of soup on the stove top. That smell that only comes from food being cooked slowly over a number of hours. The combination of meat and vegetables and seasoning that permeates the entire house as it cooks. I don't know why that's my first and strongest memory when I think of her. Or why that memory hit me as hard as it did. There were plenty of times at the house where food wasn't being cooked. And that soup certainly wasn't a common smell. But that soup is what I've been smelling all week. Algeria's chosen dish is nothing like that particular soup. But it's cooked slowly, with chicken and a good amount of spices. That scent that, after a few hours, pretty much invades every space of the house - that's the same. I don’t own a tadjine. I also, as yet, don’t own a pestle and mortar. My pantry is also lacking a number of ethnic spices. This whole project will wind up being an expensive one, I think. But my kitchen will be a place of culinary dreams by the end of it. For now though, I’ve heard a slow cooker will do an okay job in place of a tadjine, and pre-ground spices will have to be the go. Eating disorders and “safe foods” are a weird concept. Void of logic. Every person will have a list of some sort of food that is safe. If they’re in a situation where they need to eat, they’ll beeline for those foods. And they’re always bland. Dry toast or completely unflavoured oats. Chicken or salad without a hint of salt or dressing. It’s almost like spices make food taste better, and people with eating disorders are completlely wrapped up in a world of food as punishment and reward. Food that tastes good, therefore, isn’t “deserved”. I know, right? I did say there was little logic when it comes to eating disorders. Which, I guess, is one reason that this recent food journey is one of excitement. Chilli and heat is something I've discovered makes food taste amazing. Salt is God when it comes to flavour. Oil and seasoning on salad males salad pretty damn incredible. So as Algeria rolled around I discovered I'd get the chance to try something totally new to me - saffron. 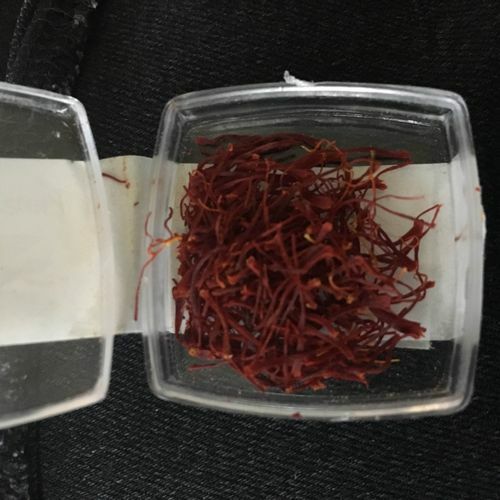 When I asked for it at my local spice shop the diminutive woman reached underneath the counter and displayed a tiny plastic container full of the stringy red spice. Half a gram for $5 she told me, and refused to put it on the counter until I paid. I felt like I was buying something slightly more illicit than saffron. Told myself not to screw it up as I walked out with it. I get the impression this is the kind of stuff I'm expected to look after. It didn't smell of much, surprisingly. A bit earthy, but an incredible dark red colour. Bordering the Mediterranean sea and the Saharan desert, Algeria’s neighbours,and culinary influences, include Morroco and Tunisia. 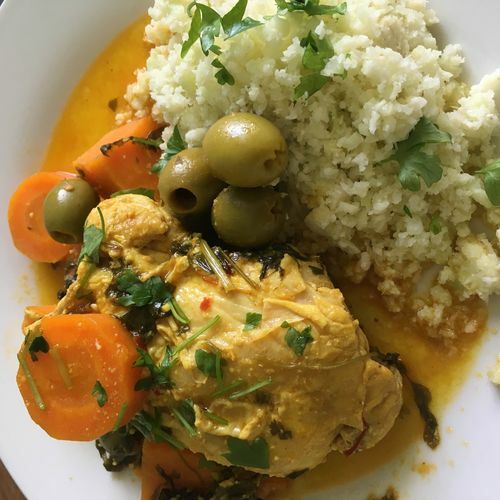 The food in Algeria seems to be also heavy on stews and long, slow cooking processes, though with more heat and spice than the previous countries. For my chosen dish, Tadjine Djedj b’ Zeitoun (I’m keeping the name – Slowcooker Djedj b’ Zeitouun doesn’t quite sound so ethnic or impressive), I'm basically cooking chicken slowly in water and spices (it's one thing I've noticed so far - stock is never really used for the ease of extra flavour - time is the key to flavour), adding spice and olives later. Having never even tasted harissa, I decided to go full authentic (well, as full authentic as one can get without a mestle and porter) and make my own. It’s easy, and has since become my new favourite additions to meals. The dish itself is incredibly simple. 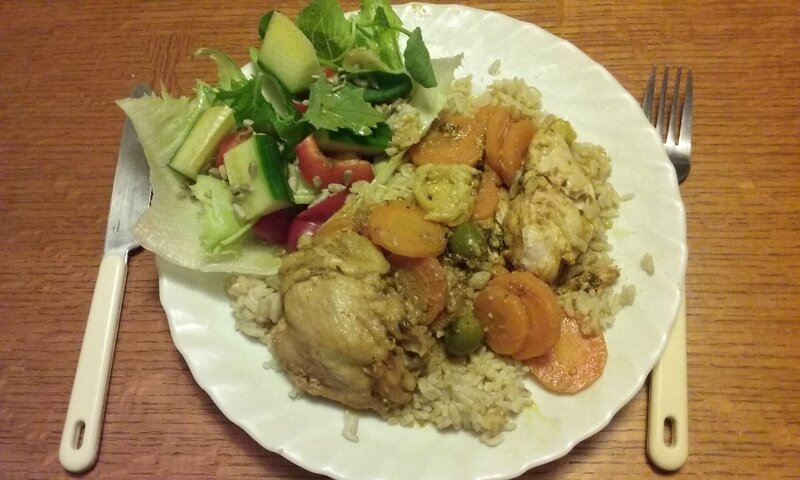 Chicken browned in a pan and transferred to the tajgine (read: Breville slow cooker), harrissa, saffron, thyme, chopped fresh coriander and water goes in, and sits for a couple of hours. At this point chopped carrots, more coriander, juice of a lemon, a big handful of green olives and pepper to taste goes in and an hour later is ready. A quick batch of cauliflower rice (or white rice if you eat it), seasoned with salt and corriander made the dinner complete. If I were basing a world trip dependent on the cuisine of the country, I think I’d put Algeria on the list somewhere. The brightness due to the saffron (funnily enough that's really all it added) and the heat and flavour from the harrisa made this one something I think I'll be making a few times more. And that smell? That permeating, homely smell that invaded the house throughout the cooking? It stuck around for a while, even after eating. That smell took me right back to my friend's mum's house again. Really enjoying your food explorations. harissa lamb ribs. That recipe makes a big batch, but I've found that you can portion it out & freeze it. Though I have a mortar & pestle, I find it easier to use a blender. Oh, I like the look of that. Especially using all of the coriander. A Mortar and Pestle can be really cheap, troll the isles of one of the asian supermarkets and you'll see a few. You want something medium sized about 15-20 cm in diameter and with some weight so you can lean into it as you grind and the spices don't spill out. BUT it can be hard work and it's much easier to use a cheapish coffee grinder one of the ones with blades that are useless for coffee but they work great for spices, they're usually about $50 but I'm sure you could find one cheaper. They're small enough to pick up and shake as you grind and it's lots easier than using a mortar and pestle :). As for a tagine, they are pretty, but a slow cooker is just as good and much more of a multi-tasker than a tagine. If you have space in your kitchen (we don't) and lots of money to spend you can find some beautiful tagines that are as much art pieces as cooking implements. Also you obviously already have a slow cooker but if you didn't I'd recommend the Breville duo which can double as a sous vide bath as well. Kind of ugly but works really well. Combined with a vacuum bagger of some kind you get a whole other range of cooking options. Saffron in Te Pai Pl off Lincoln Rd is a great place to buy herbs and spices and dry goods. They have a huge range in bins. They also have Medditerranean foods. A good cast-iron skillet can be had for not-much from camping shops, as can big hefty cast-iron pots with a lid for casseroling and pot roasting and baking pretty much everything. For near a decade I had those plus a small cast-iron frypan as my only cooking pans and dishes: they stir-fried, sauteed, steamed, roasted, baked sticky crumbles, pies and cakes. The skillets have a choice of wooden handles or looped iron, which means you can use them as pie dishes. Finally got around to making this. Made the harissa using the oil and chicken fat left in the pan after browning the chicken and it worked out well. Crockpot didn’t heat up well, so had to crank it up and the end to get it cooked properly, but it turned out okay. Went a bit light on the chilli and cayenne for my daughter’s sake, but she decreed it was the perfect amount of spiciness. Served on brown rice, with a side salad.